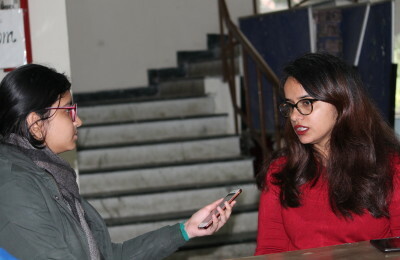 This year’s edition of Renaissance, the annual cultural fest of Kirori Mal College kicked started on Wednesday, the 25th of March. The three day event saw its fair share of highs and lows, with a few events getting cancelled, competitions attracting good participation and a packed star night. Nine western dance teams from across the University participated in the competition. The event was judged by Makkhan a.k.a Sagar Verma and Shown Kohli, teachers at Delhi’s reputed dance institutions like Brooklyn Dance Academy, Big Dance and Hash Aerobics Studio. The event began with all the teams performing their annual productions, most of which were on the medley of Hindi, Punjabi and English songs. As the crowd gathered and cheered for their favorite team, the second round of the western dance competition saw the dance war between teams. One member from each team represented their respective colleges for the dance war round. Day 1 at KMC witnessed informal set of events like creative writing and taboo. The fest also saw few other filler events like street football, spell bee and poster making apart from solo singing, solo dance and one-act play. The second highlight competition was the Fashion show which saw participation from different fashion societies of Delhi University. Portraying various roles, the members put up their annual acts which revolved around various social topics. The guest star, Bhaanu Pratap Singh took the stage at KMC post the Fashion show. He sang various famous Hindi and Punjabi numbers like Tum Hi Ho, Brown Rang along with his own compositions called Kalli, Head 2 Toe and Bin Tere. The crowd danced and enjoyed to the songs and beats of the singer. Second day at Renaissance ended with a DJ Night with the set being played by DJ Bharat. The final day at Renaissance 2015 witnessed the choreography competition. The event saw participation from Lady Shri Ram College and the host college, KMC. With 15-20 minutes given to each performance, the acts revolved around a particular theme. The choreography dance competition was judged by Vicky and Manjeet. Kirori Mal College’s annual cultural fest, Renaissance, came to an end with Pakistani American rap artist, Bohemia’s performance. While the show started late, the rapper more than made up for it by singing to his fans in the audience all his hits. As people in the crowd rapped along with him to Kali Denali, some were scaling the main building in a bid to get a better view of the artist. The Punjabi hip hop rapper sang his two-hour set with other numbers like Charso Bees, Ek Tera Pyaar, Jaguar and Dil. The concert was attended by over 5000 students from the University. In between the songs, he talked about his experience growing up in California and his yearn to connect with South Asian culture as a young man. He included jibs at MTV and other artists in the desi pop and hip hop industry to loud cheers from the audience. Like always, Renaissance’s closing concert seemed to have been a hit and had won over the attendees. Events and competitions at Renaissance were anchored by guest hosts Raghav, Devansh and Vikrant. After three days of events and competitions, Renaissance 2015 came to a successful close on the 27th of March. Here’s looking forward to its next edition!